Over the last few weeks I’ve been exploring principles that are evident in many successful blogs. So far we’ve looked at Listening, Trust, Usefulness and Community. Today I want to get personal with you and share a story with you. Last week while at Blog World Expo I was coming down off the stage after presenting on a panel when out of the corner of my eye I noticed someone moving towards me – fast. Within a second of seeing the movement I was literally jumped upon and found myself in a tangle of arms, hair and tears – I was being hugged within an inch of my life. I didn’t know what to do at first – I didn’t know who was hugging me but while a bit of a shock at first I could tell the person was genuine and so did the only thing I could think to do – I hugged back. After a few seconds of hugging the person pulled away. I had expected it to be someone I knew but realised pretty quickly that this was a stranger (or at least she had been a moment or two before). She had tears in her eyes and was obviously emotional – I didn’t know why until she began to talk. For the next 4-5 minutes my hugging assailant (a reader as it turns out) talked, almost without taking a breath. She told me about the first day she read my blog (she remembered the first post), she told me about how it had helped her, she told me about the ups and downs of her blogging, she told me about her family, she told me about my family, she told me that she’d bought my book, joined my community, bought my ebook, she just talked…..
She talked as if we’d known each other for years – I guess in a way we had…..
As we continued to speak I realised that here was someone who I had previously not known had existed (she’d never left a comment or said a word on my blog in over 3 years) who ‘knew’ me – at least to some degree. Here was someone who’d not only read something that I’d written daily for years – but someone who had watched my videos, had noted when I’d become a Dad, had seen when I’d travelled, had observed my disappearances from the blog when I’d been unwell. She didn’t know all this stuff because she was a crazy stalker (far from it) but because I’d allowed myself to blog in a way that was personal. By no means am I the most personal blogger going around. Everyday I see opportunities to be more personal in fact – but I’ve made a concerted effort over the years to inject something of myself into what I do – and it’s paid off. It’s paid off not just in terms of being jumped on by strangers when overseas but also in creating the kind of site that people want to come back to, the kind of site that people recommend to others and also the kind of site that people want to spend their money on (remember my friend has bought everything I’ve released – she said she did so because they were ‘mine’). I know being personal on a blog is not something that everyone feels comfortable with and that is in everyone’s style – but it is one thing that I’ve seen exhibited in many successful blogs. How about you? Do you take a personal approach with your blog? PS: one piece of advice – when it comes to being personal I’d suggest bloggers think a little ahead about what they will and won’t reveal about themselves, their family and their lives. Having some boundaries in place for personal safety can be a worthwhile thing – this doesn’t mean you’re not being personal, just that you’re being smart and exhibiting some personal safety. 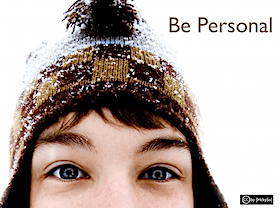 being personal is key because it humanizes the person behind the blog. for me, being personable IS my brand. i want readers/viewers to connect and relate. and feel that they can open up to me. i’m personal through what i share and how i present myself through my videos and blog. thanks for a great article, darren! I do 7 of the 9 things you listed, Darren. I totally agree that being personal is the way to go. Not only do readers dig it more, it’s easier, as you don’t have to remember to pretend to be someone else all the time. In fact Darren we all would love to thank you. Because after arriving at your blog we feel that we are at a honest and real man’s place who is far away from controversy (like other had with google or on tweet with Matt). You always concentrate on those things for which this blog is. And we all are thankful for that. Hillarious post. So well written (but aren’t they all?). Your comment about being careful about what we share brings something to mind. Although I don’t say anything that I regret, it is like being hit over the head with a brick when a friend, or local acquaintence, says, “yah, you said____ on your blog.” I totally forget that there are local people who read my blog and it bothers me that I shared personal information because I am so private that I don’t like people knowing me on the level that I’m sharing. In my mind, I feel secure behind the computer and totally forget that anyone knowing me will get to know me better. I know many people admire you. You will be shocked to know that after the 6 months of blogging this is my first visit to your blog and now I know why people talk about it. I personally don’t like to be more personal on my blog as it is not a personal web blog. I have always felt that being personal in your blog is a good thing. (like you said with boundaries) It helps your audience to connect with you and genrally humans a drawn to human emotion. If you appear more of a buissness or a group than an individual, people feel you are less approachable. You don’t seem you could relate. I’m very personal on my blog as it’s the re-telling of the ups and downs of my family’s life. But I’m choosey and deliberate about what I share and what I don’t. Just coming out of lurkerdom as one of the readers who appreciates this blog VERY much! Your tips and advice have been incredibly helpful to me and I have always enjoyed the relateability of this blog. I stopped following a couple of blogs because their authors ceased to be personal in order to focus exclusively and “seriously” on a specific topic. Meh. There are a lot of places where I can go for a dry, impersonal take on a variety of topics. I read blogs for a totally different reason. A very good post and subject. I’ve oftened wondered how personal to get on my blog that is trying to promote my artwork. I’ve never wanted to alienate anyone, but maybe I have room to share a bit more. Everyone tries so hard to be “correct” sometimes. After I read the story I realized I kind of felt like I knew you too. From your trip to Vegas (I recommended a restaurant) to the freaky guy on your street the other day, both from your tweets. So I guess it’s not all that weird to share a bit of our personal lives…the freaky guy kind of made me chuckle! Since then, even though I purchased 31 Days to a Better Blog, this is the first time I’ve really been on your site, so I guess it works! Yes, I agree that being personal is an important thing to do as a blogger. Blog is me and I personify myself in my blog. That way I can make better relationship with my readers, both online and offline. I agree….sharing personal tidbits makes your blog ‘human’ and relatable. If readers can’t put themselves in a real person’s shoes, there’s not much to keep them coming back. You may as well be writing the equivalent of a technical article in the Apocalypto language. I am drawn to blogs where the writer makes me feel at home and gives me a reason to want to check in with them another day (much like Problogger does). As the owner of a budget travel blog, I think it’s important to allow the reader access to my personal experiences in saving money while traveling. Thanks, Darren for your common sense approach to things that tend to go over a newbie blogger’s head, like myself. I will keep reading and learning from each and every one of you. What a powerful story. It is great to share information with our online community. Thank you for sharing yet another aspect of your life. This is my first comment in your blog. I’ve been reading your blog for quite some time now and I thought it’s time for me to comment too. Anyway, as I see it, the power of being personal in a blog is when the writer tells the story with humility and honesty. That is probably one thing that I like about your style, it’s the humility behind it and your honesty. I always say to myself and to my friends, that you cannot really judge a person by the way the person writes. You have to meet and see this person face to face to know what this person really like. But in your case, there is a little bit of transparency so somehow you gained my trust. One thing that I just don’t give to anybody. You were very right, when you were writing all those things about TRUST in blogging. You earned it. Ha, what a fantastic story! I’ve only recently started adding personal touches to my blog (including photos, which I was reluctant about) and they have paid off tremendously in reader engagement. I guess it’s not surprising I have been having similar experiences lately when readers have recognized me in public and started gushing enough to embarrass us all. It’s cute though, and I think a good thing. Great post Darren, Definately the days of hiding behind a pen name, no longer interacting are far behind us. Social media like twitter has totally ripped the mask off and as ive said to a few celebrity friends, if you want to build a large community of people who like your word in acting and music you had better start being the one who interacts with them. I’m new to the blogging world and trying to figure out my style. My blog covers topics associated with health care from a patients perspective. I feel personalizing the blog with personal information lends itself to more credibility. The part about boundaries may make the difference in a blogger being comfortable about getting personal. I try to use some humor and a little life story in each article, but my litmus test is: Would my mother like to know about this? Keep up the thought provoking posts. Maybe an article on author burnout might be appropriate some time. I think its essential to inject personality into a blog, with the twitter/facebook lifestyle we all live in today its much more engaging to get to know a dotcom owner with photos & videos. It seems like apart from the SEO kings that started their dotcom’s way back in 2000, this is the only way to make it in the dotcom world. I would say photos, videos and a mixture between informative and entertaining posts = 1 million visitors a month! Darren, I couldn’t agree more. Striking the right balance between being personal and revealing too much is essential. It’s good to know that there are still people out there that think you should be personal on your blog! It’s a growing trend to just advertise and give tips and fall away from the personal side… As a reader, I want to feel connected to the writer and the blog owner. Keep it real! I think that is a great hugging story to share, and I agree with your points about being personal as a blogger. Even though I write a professional blog, I think my readers enjoy it because they feel like they know me, they know my professional background, and they can relate. Of course, I set boundaries for both personal and professional reasons (like wanting to keep my job), but I also share information to advocate for causes that are important to me and to let my readers know how I cope with the stresses of my professional. Except for humorous professional blogs which are understandably sometimes authored anonymously, I don’t follow professional blogs if the author does not reveal his or her identity. Too many people set up blogs for monetization only. I need to see the author’s bio and face to establish credibility. This is amazingly true. I have noticed over the years (I’ve been blogging and running websites for five years although I’m starting with new ones), that if I write a transcript for a video post and then post it on my blog, it is a lot better than if I wrote it for the blog. People like to feel like you’re not a robot but a real person, and they love to see your personality and interact with you. hey your are perfectly correct. i had been reading your blog for sometime. thought i should leave a comment at your blog. don’t worry i will not hug you when we will meet somewhere. Once we begin to be authentic, and see how that brings us closer to ourselves…we also understand that our inner fusion allows us a connectedness with others that was previously out of reach. It’s this inner congruence and unity that gives us the confidence just to be…this to me is what authenticity is when translated in the realm of experience.